Alpha-1 proteinase inhibitor (A1PI), also known as alpha-1 antitrypsin (A1AT) and alpha-1 antiproteinase (A1AP) is the archetypal member of superfamily serine protease inhibitors (SERPINs). A1PI is the only known inhibitor of elastase but also inhibits trypsin and chymotrypsin. As an acute phase protein, A1PI is commonly associated with regulation of inflammatory reactions, especially in lung tissue where its main function is to inhibit neutrophil elastase. Binding of the target protease to the reactive center loop (RCL) of A1PI is irreversible and proteolysis results in a conformational change rendering A1PI inactive. A notable and often ignored feature of A1PI is that its activity can be regulated by oxidation of the sulfur containing amino acid methionine. Reactive oxygen and nitrogen species (ROS & NOS) can both react with A1P to create methionine sulfoxide (MetO) residues at key sites resulting in inactivation of the enzyme. 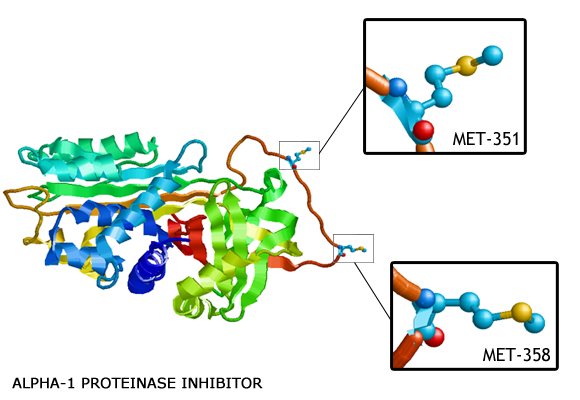 Regulation of A1PI in this fashion is reversible by the action of methionine sulfoxide reductase, an important regulatory enzyme of interest in redox related research. The action of ROS and NOS in helping to regulate the activity of cellular housekeeping proteins such as A1PI is fast becoming a major area of interest in researching many disease states. In contrast to ELISA measures of total protein, monitoring of A1PI activity levels provides useful information about actual enzyme function and measurement of A1PI activity in both control and experimental samples may be useful as an index of ROS/RNS oxidative stress effect on proteins. The NWLSS™ NWK-A1PI01 is intended for measuring the activity of alpha-1 proteinase inhibitor in biological research samples. The NWLSS™ MsrA ELISA kit is intended to be used for the in vitro quantitative determination of Methionine sulfoxide reductase A (MsrA) in human serum, plasma, cell lysates and cell culture supernatants. ELISA kit for quantification of human methionine sulfoxide reductase B in biological samples.